20 pp. Roman, 122 pp. Saafi-Saafi (also known as Safi or Sereer-Safen) is a Cangin language of the Atlantic branch of Niger-Congo, spoken in Senegal (Pichl 1966). Saafen is the name for the area(s) in which Saafi-Saafi is spoken. There are an estimated 200,000 speakers of the language (Lewis et al. 2015), situated primarily in 60 villages across the Thiès region near Dakar. According to Ethnologue (Lewis et al. 2015), there are five dialects of Saafi-Saafi: Boukhou, Sébikotane, Sindia, Hasab, and Diobass. The present work describes aspects of the Sébikotane variety as spoken in and around the town of Sébikotane. The only other published material on Saafi-Saafi is Mbodj's (1983) doctoral dissertation on the Boukhou variety and three short articles (Dijkstra 2012, Faye and Dijkstra 2005, and Dijkstra and Dijkstra 1997). This dictionary developed out of work initially conducted in a field methods course at Indiana University during the academic year 2011–2012. Subsequently, additional time was devoted to compiling lexical items from various extant sources as well as from several individual speakers. The dictionary is intended to fulfill two purposes: First, it represents a contribution to the meager published sources that are available on Saafi-Saafi in general, and on the Sébikotane variety in particular. Second, it provides, as part of this introductory guide and in the appendices, some basic information on several aspects of the grammar—noun classes, definiteness and specificity, pronoun paradigms, verb forms and derivations. 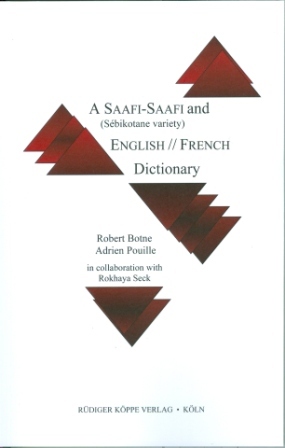 The dictionary contains approximately 1,600 headwords for the Sébikotane variety of Saafi-Saafi. Although modest in size, this represents much of the basic vocabulary in the language. The appendices include a listing of kinship terms, noun classes, definiteness marking, pronoun paradigms, numbers, names for days / months / seasons, verb suffixes, and verb tense / aspect marking. This dictionary is intended to serve as a basic resource both for linguists and for those interested in Saafi-Saafi. The dictionary under review is “intended to serve as a basic resource both for linguists and for those interested in Saafi-Saafi”. It should certainly be able to serve both groups. People who want to learn Saafi-Saafi (sav), a Cangin language of the Atlantic branch of Niger-Congo, spoken in Senegal will find it a useful book, and it would be worthwhile investigating how that (small) market could be reached. As the introduction says, it gives much of the basic vocabulary, and with glosses and reverse indexes in both French and English, as well as some basic grammar, it should be able to serve most expatriate and Senegalese learners. Saafi speakers do not single out a “prestigious” or “most correct” dialect, so if some words and expressions are recognisably Sébiois, that should not be a problem. Linguists should also be able to use it, but they should be aware of a few problems in the areas of spelling, grammar and culture.